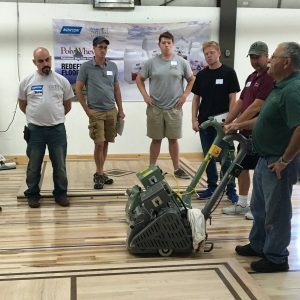 Take your sand and finish skills to the next level with this high level training intended for experienced professional flooring contractors. Join Norton Abrasives and Vermont Natural Coatings at our headquarters in Hardwick, Vermont for several days of hands-on training with the our expert instructors. You’ll have the opportunity to work with Norton Abrasives products, including Norton|Vermont Natural Coatings Professional Wood Floor Finishes. NWFA instructors Greg Mihaich and Bob Goldstein lead attendees through all phases of the sanding and finishing process. You’ll master advanced sanding techniques for minimizing scratch patterns and getting an optimal finish on all species of wood and parquet floors, how to work with custom colors, bleach and dies and how to make seamless repairs in stained floors. Learn how to apply new EasyWhey ™ Floor Color to change the colors of wood floors without sanding down to bare wood. Guests will also have the chance to enjoy Vermont’s renowned Northeast Kingdom, celebrated for its beautiful rural scenery, as fall foliage season intensifies. There are few better places to experience the beautiful sights of the Green Mountain State than at the historic Lakeview Inn, where attendees will be staying and where we will also sample some of the award-winning foods and drinks the region is known for! Receive three credits towards your NWFA degree and $100 in free sandpaper product per company. COST: Instruction: $500 per person due upon RSVP. All meals and lodging provided. Students are responsible for their own transportation. To view the class’s detailed itinerary, please download the PDF here. Sign up by September 5, 2017 with Audrey by contacting ahix@vermontnaturalcoatings.com or calling 802-473-3292!